Most of you must have already started seeing Google Ads Suggestions card in the Recommendations tab of Google’s new Google Ads interface. If you aren’t, don’t worry. You shall see them soon. I want to discuss this new addition, Google Ads suggestions, in-depth in this article. If you are wondering what is there to discuss, trust me, there is a lot. HOW DOES GOOGLE PROPOSE ADWORDS AD SUGGESTIONS? WHY DID GOOGLE IMPLEMENT ADWORDS AD SUGGESTIONS? 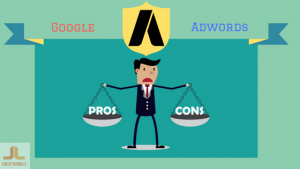 HOW TO MANAGE ADWORDS AD SUGGESTIONS? What are Google Ads Suggestions? Google Ads Suggestions are some modifications to your current text ads that Google believes would help increase the performance of your campaigns. You will see these suggestions in the Recommendations tab in the new Google Ads interface. This is good, right? Google is helping you improve your ads. Yes, it is. But, there is a catch. Google will apply these changes to your ads automatically after 14 days of suggesting. How does Google propose Google Ads Suggestions? Google announced that it would use the existing data in your account to propose these suggestions. It reads ad copy aspects such as headlines, ad descriptions, extensions and landing page content. Google declared that Artificial Intelligence ( Machine Learning & other components) under human supervision would create initial ad copies. Why did Google implement Google Ads Suggestions? Google said the aim of Google Ads suggestions and other such initiatives that involve AI is to make Google Ads more efficient and easily accessible for advertisers to use. Google believes that such automation is necessary as it eases the burden on advertisers while reducing the scope of error. How to manage Google Ads Suggestions? Advertisers have full control over ad suggestions. You can edit, apply or dismiss a suggestion from the recommendations page. If an ad suggestion is automatically applied, you will see a tag “auto-applied ad suggestion“. You can edit it, pause it or remove these just like other ads. To opt-out of Google Ads Ad Suggestions, you have to go to “Account Settings” page and turn off auto-apply ad suggestions. If you have an MCC account, you can turn off auto-apply ad suggestions in bulk from “Accounts” tab. Click on “Management” and then select the accounts. Click “edit” and “change ad suggestion settings“. Google Ads Ad Suggestions are both useful and tricky. Even though Google gave advertisers the flexibility to disable auto-apply, it still would be showing suggestions. You cannot turn that off the notifications, at least for now. The idea of optimizing ads for better performance is noble. However, the scary part is how Google is slowing taking more control over the administration of individual Google Ads campaigns. Google Ads Ad Suggestions can be an excellent addition to those advertisers who are new. But for advertisers with exhaustive ad counts, it is very likely that an ad or two could slip past their watch. Even the slightest of carelessness can result in enormous losses. If you have in-house Google Ads management who can monitor the results from ad suggestions closely, you can opt-in. But, if you are an MCC account, it is best if you ask your clients to opt-out for now. There is no significant data available to gauge the change in the performance of Google Ads accounts that use Ad Suggestions. For more latest updates, fundamentals and advanced topics of Google Ads and PPC,visit our Google Ads and PPC blog.